Can magic really be this entertaining? But of course...! 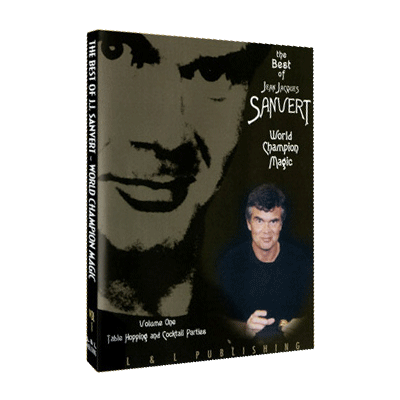 On this volume, J. J. performs the tricks he uses in strolling situations, much to the obvious amazement and delight of the studio audience. Then, after the show, J. J. rolls up his sleeves and shows you how you can perform his award-winning magic, too! Killer Card Routine - This is J. J. 's favorite and it features some of the most eye-popping card effects ever created, all rolled into one ten-minute tour de force. It's the routine that J. J. makes his living with. Coin Routine - Take a purse frame and add some half dollars, a few Chinese coins and a couple of spectator's hands and the result is a six-minute coin routine that, as soon as you learn it, you'll perform for the rest of your life. Break the Ice - This is the routine J. J. uses to first engage a group in a cocktail setting. A touched card behaves in a variety of startling ways that includes visibly appearing on the face of the deck. Reversed - A peeked-at card magically reverses itself in the deck and then penetrates through the deck to drop onto a spectator's hand. For the finale, the entire deck reverses itself around the selection! Daryl's (and JJS') Boomerang - A peeked-at card visibly jumps out of the deck and into the performer's other hand and then jumps back again. The card travels across one more time - invisibly! Your Favorite Card - A spectator is asked to name any card. The selection is apparently missing from the pack so the performer takes three random cards and, one by one, changes them into the named card. For the finale, the three cards turn into the mates of the selection while the missing "favorite" card is found in the performer's pocket! Cigarette Thru Coin - With a politically-correct presentation (smoking is bad for you!) and a handling that utilizes only one hand, J. J. breathes new life into this classic. You'll also marvel at the switch at the trick's end, though you probably won't see it!